Make no mistake: the higher the unemployment rate in November 2012, the less likely President Obama is to win a second term. But we should be careful about asserting that there is any particular threshold at which Mr. Obama would go from favorite to underdog, or any magic number at which his re-election would either become impossible or a fait accompli. Historically, the relationship between the unemployment rate and a president’s performance on Election Day is complicated and tenuous. …historically, the correlation between the unemployment rate and a president’s electoral performance has been essentially zero. Unemployment increased by 1.9 percentage points over the course of Richard M. Nixon’s first term, but he won re-election easily. It also increased in George W. Bush’s and Dwight D. Eisenhower’s first terms, and their re-election bids were also successful. The unemployment rate fell to 3.9 percent from 5.3 percent, meanwhile, in Bill Clinton’s second term — but his vice president, Al Gore, could not beat Mr. Bush in the Electoral College. There are also cases in which the data behaved more intuitively: Jimmy Carter and the elder George Bush all faced high unemployment rates when they lost their re-election bids, as did Gerald R. Ford in 1976, and that was surely a factor in their defeats. 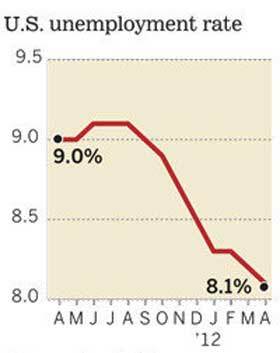 The unemployment rate fell to 8.1% in the period, down from 8.3% in the previous quarter. The ONS figures showed that the number of people in employment rose by 181,000 to 29.35 million. However, the number of people claiming Jobseeker’s Allowance rose by 6,100 to 1.6 million in June. The number of long-term unemployed also increased, with those out of work for more than two years rising by 18,000 to a total of 441,000, the highest since 1997. Average total earnings were 1.5% higher in the year to May, the ONS said. When bonuses are excluded, regular pay rose 1.8% from a year earlier. On average, UK workers earned £442 per week excluding bonuses. 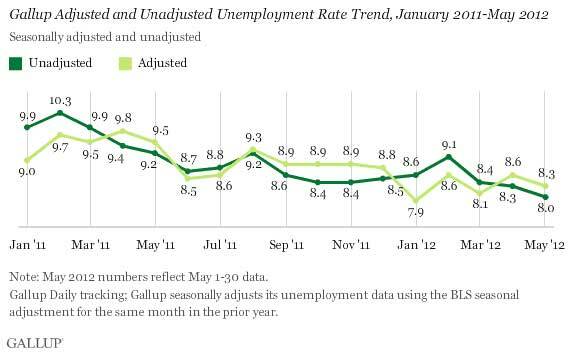 U.S. unemployment, as measured by Gallup without seasonal adjustment, dropped to 8.0% in May, a new low since Gallup began measuring employment in 2010, and more than a full percentage-point decline from May 2011. Gallup’s seasonally adjusted number for May is 8.3%, down from 8.6% in April. However, that remains higher than the seasonally adjusted low of 7.9% recorded in January 2012. Despite recent drops in unemployment reported by Gallup and the U.S. Bureau of Labor Statistics, the U.S. employment situation remains fragile. Fragile…or, rocky as seen in the graph above where the numbers have been rising/falling since January 2012. Tomorrow the U.S. government’s will publish its own unemployment numbers form the Bureau of Labor Statistics. Hiring continued its slow pace in April as employers added a modest 115,000 jobs to their payrolls. The jobless rate inched down to 8.1% last month, the Labor Department said Friday, but that wasn’t because more people were employed. Rather, the rate fell as more workers dropped out of the labor force (about 342,000 workers). The April jobs report was highly anticipated because job growth slowed sharply in March after three strong winter months of payroll gains averaging 252,000. Job growth last month was bolstered by continued strength in manufacturing, which added 16,000 jobs to payrolls, and professional services such as architecture, engineering and computer systems design also increased staffing. Wages overall were subdued; average earnings for all private-sector employees went up by a mere penny from March, to $23.38 an hour. Unemployment rate normal for college grads – so why Occupy Wall Street? For some reason I thought that not having a chance to get ahead was a big part of Occupy Wall Street. That the top 1% is running away with money from the bottom 99%. Unfortunately, the unemployment data below confuses that story. It shows a serious education issue and major problems in the African-American community, but not a widespread problem among the 99%. In fact, if you take those groups out of the equation then the problems are nearly wiped away. Our college grads have an employment rate of 4.2%. The white and asian communities over-all have an unemployment rate around 6.5%. An unemployment rate of 4-6% is considered normal for a healthy economy, taking into account those between jobs, career changes, etc. Perhaps, the message for Occupy Wall Street should have been to get more kids through college and help out the African-American community? I want to encourage you to come to your own conclusions about these numbers. What did you come up with? One I came up with is that it certainly pays to be a college grad (4.2%) and be self-employed (5.2%). Both have the lowest unemployment rates. Posted on December 15, 2011 Author robotchampionCategories defaultTags african-american, asian, black, bureau, bureau of labor statistics, college, college graduation, education, graduation, occupy wall street, ows, unemployment, white2 Comments on Unemployment rate normal for college grads – so why Occupy Wall Street? Do young Americans want to work? As in, get a job? Despite all the haranguing on our economy and jobs market, why aren’t we talking more about the massive labor imbalance in our country? A recent Rutgers University survey of 571 Americans who graduated from college between 2006 and 2010 found that only 53% held full-time jobs. And yet, it’s not hard to understand why. In 2009, of the 1,601,000 bachelor’s degrees conferred, the greatest numbers fell into the fields of business (348,000); social sciences and history (169,000) and health sciences (120,000). The health sciences are concerned with the development of knowledge and programs related to health and well being. Health science is also concerned with the study of leisure and cultural phenomena. And just so we’re all on the same page, social sciences include: anthropology, archaeology, communication, criminology, political science, sociology and psychology. I’m going to refrain from commenting on the social and health science and history majors and instead take a moment to focus on business majors. You would think having a prevalence of business majors would be a positive for our economy, but we first need people who can actually make something before we need the people to market, sell and manage it. We are missing the makers (engineers and scientists), the people who have the skills and knowledge to create something. The fact is, there are jobs in this country. According to the most recent report from the Bureau of Labor Statistics, over three million job opportunities are unfilled in the United States right now, the highest level in three years. And yet, in that same period we have produced the highest unemployment rate we’ve seen in over two decades. I was at my alma mater (James Madison University) a few months ago and caught up with a former professor in the college of Integrated Science and Technology (ISAT) ; she told me that enrollment numbers in ISAT were the lowest they’ve ever been, even though these students are the most desirable and in demand by employers. Given the current economy and jobs market, I was a little shocked. I’ll be honest here and say that when I was 17, college and majors didn’t consume my thoughts nearly as much as boys and field hockey. I went to JMU because it had the best field hockey program in the country. And my parents essentially chose my major for me. I was pretty ambivalent about what I wanted to do. There was lots that interested me (minus Accounting). At one point it was Law, another time English, I even considered Business. But my parents reasoned that I was good at math and science and the world needed more women in STEM, so I said sure, why not. When I graduated, I had 15 job offers. Looking back, I’m certain my collegiate experience would have been a lot easier if I majored in something that didn’t require me to spend so much time in computer and science labs, but in this tech-centric day and age, I’m glad I left knowing how to program and build a website, amongst other things. How many young Americans today think about employability? 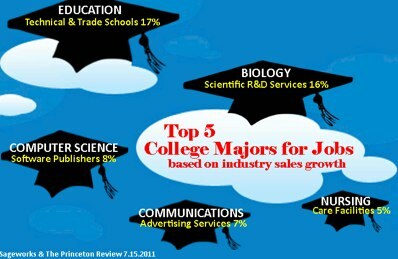 If you look at the degrees that are most likely to land a person a job, there seems to be a disconnect with the majors students are pursuing the most. Case in point, in 2009, degrees in “parks, recreation, and leisure studies” saw a 43 percent increase. Yep, the things with budgets first to get cut in a recession are what students are flocking to. I’m not saying people should neglect their true callings in life. In fact, I think the world benefits the most from the people who vigorously pursue their passions, including social psychology majors (who have the highest unemployability rate). But for those who aren’t so sure what path to pursue, wouldn’t it make sense to take a look around, at the state of the country, and consider majoring in something employable? Posted on September 14, 2011 Author robotchampionCategories biz, culture, default, TechnologyTags business, college, economy, employability, jobs, labor, major, market, unemployment3 Comments on Do young Americans want to work?